Forget traffic jams and packed trains and leave your bike at home. This week’s Littlefish Loves feature presents the latest solution to commuting woes and the newest way to get around: a self-balancing electric unicycle called the AirWheel. It might sound like something that belongs to some sort of crazy futuristic circus, but the AirWheel has been flying off the shelves at Harrods, selling out online, receiving rave reviews and, apparently, transforming the way we travel. So it won’t be long before your commute is punctuated by savvy travellers drifting casually down the street – because walking is just so last century. The AirWheel works a bit like a Segway – you lean forward to go, back to slow down, and sideways to turn. It can reach speeds of 14mph and it’ll do 30 miles on a single charge – plus, it’s cost effective, environmentally friendly and easy to carry. 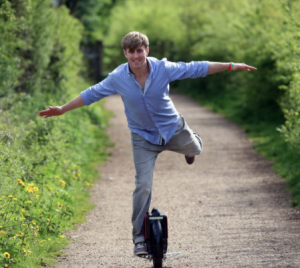 We haven’t tried one out yet (though we’d like to, even if just for the laugh) but reviews claim that once you get the hang of the electric unicycle, it’s easy to ride. The promotional video even shows users casually whizzing past with a cup of coffee in hand (skill).